Renewable energy is an ongoing conversation because it’s a relatively new technology being implemented all over the world. What are the benefits? What are potential issues? How do we take advantage of green energy while still supplying power to the world? These are all valid questions, and as the solar, wind, and water energies advance to meet the world’s needs, West Coast Solar believes the benefits of green energy sources is worth the investment. 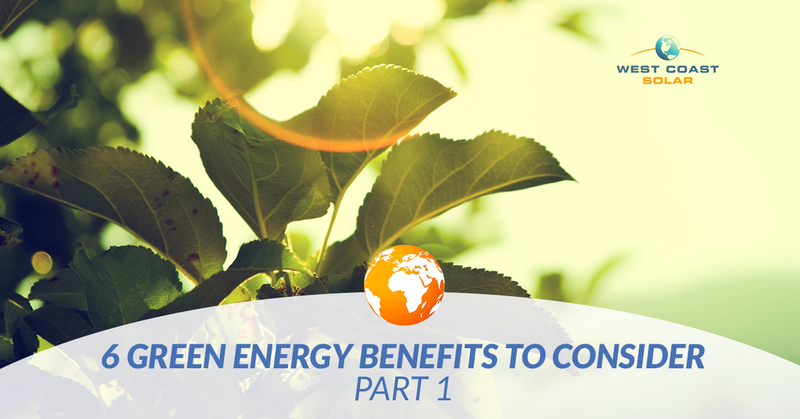 Want to learn about some benefits of Green Energy? West Coast Solar shares six in the following two blog posts! Get your notepad out. West Coast Solar takes public health seriously. It’s a big reason for why we are pushing for renewable energy. Unfortunately, a collection of health issues have been linked to air and water pollution. Harvard reported a study showing that the estimated public health effects and life cycle costs of coal to be upwards of $74.6 billion per year. The staggering fact is that the 4.36 cents kilowatt per hour cost of coal and its effects is only a third of the average electricity rate for U.S. homes. There are alternative, renewable energy sources, which begs the question: Why do we continue to use fossil fuels and not commit to green energy quicker and sooner? Renewable energy, such as air, solar, and hydroelectric do not produce the harmful toxins filling our atmosphere like carbon-dioxide or methane. It’s important to note that geothermal and biomass systems do emit pollutants, but the emissions are far below that of coal or other fossil fuels. Also, air and solar energy sources do not require water to supplement their energy gathering process like coal, gas, or oil, which require water to cool some portions of the process. The use of green energy reduces pollution, provides a healthier energy gathering and distribution process, and promotes environmental awareness. Do you know the percentage of global warming emissions produce by our electricity sector in the United States? It’s nearly 30%. What does this mean? Humans constantly fill the earth’s atmosphere with carbon-monoxide, methane, and other toxic chemicals, which are trapped. These toxins act as a blanket and traps heat from escaping earth’s atmosphere, resulting in the average global temperature to rise over time and causing more violent storms, rising ocean waters, and droughts. Global warming is a known issue, so what can we do about it? A known solution is green energy. It produces little to no pollutants, way below the fossil fuel pollutant production threshold. Many renewable energy life cycles show minimal pollution overall. Replacing the current fossil fuel energy systems is possible. What should we associate with green energy? Sunny skies, strong winds, ocean waves, and heat from the earth and sun. These are all sources of energy we can leverage with a small to non-existent negative impact on the planet as a whole. In a recent study, it was determined that renewable electricity currently available today alongside a more flexible electricity system could supply at least 80% of the United State’s energy needs by 2050. Want to save big on utilities? Want to go green with your energy consumption? With over 10 years of experience installing and serving Northern California, West Coast Solar strives to keep solar simple. Read part II here! Not sure where to start or how to add green energy to your home? Call today to get started on your renewable energy solar panel project!